Bile is that yellow-green fluid tha t comes up when you have no food left in your stomach to throw up but keep vomiting. A pretty nasty thing when mixed with gastric acids and in your mouth. It is vitally important for your survival, as you’ll see. 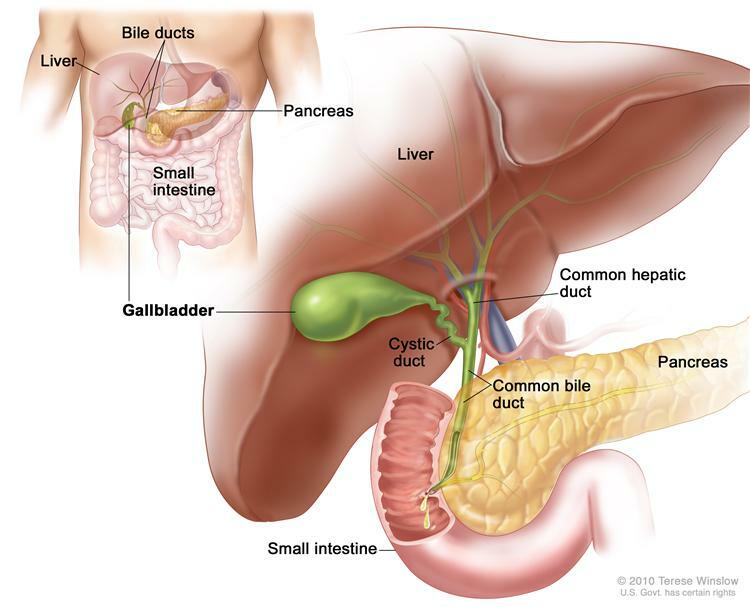 Bile is made in the cells of the liver transported through the bile ducts to the gallbladder where it’s stored and concentrated, waiting for the next meal to release it into the duodenum. Bile is mainly consisting of bile acids, cholesterol, lecithin and phospholipids, a special kind of lipid that is a main molecule in cell walls all over the body. It also contains Immunoglobulin A (IgA), which important for inhibiting bacterial growth in the bile. It has two main, and very important, functions. Providing a sole route for excreting many waste products, toxins and other solutes that the kidney can’t handle. Examples are fat soluble drug metabolites, plant sterols and break down products from red blood cells, also called billirubin – giving the bile it’s yellow color. Making digestion of fats and fat soluble substances possible through the bile acids or the bile salts. The bile salts consist of conjugated cholesterol that act as an emulsifier in the intestine and makes it possible for the digestive enzymes from the pancreas to act on the fats in the food. When secreted into the dudoenum and mixed by the peristalsis of the bowels with the food the bile salts form lipid droplets, called micelles, together with the fats. The salts have an hydrophilic (water loving) and an hydrophobic (water repelling) side and collect the fats on the inside. 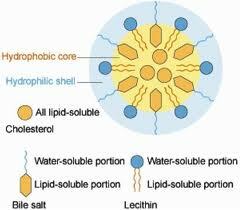 The phospholipids and the lecithin have similar actions and together they make the break down and absorption of fats and the fat soluble vitamins A, D, E and K possible. The electrical charges of the bile salts also prevents the micelles to aggregate into bigger fat molecules again and thus gives a bigger surface area for the pancreatic enzymes to work on and thus facilitating the digestion of lipids. Without bile most of the fat content of our food would pass through our intestines untouched, giving rise to fatty stools, or steatorrhea. Bile is secreted in response to food in the bowels through a hormone called cholecystokinin. This hormone is secreted mainly in the duodenum in response to the fat contents of the food and acts on the sphincter (ring formed muscle) so that bile can pass from the bile duct into the bowels. We use between 12 to 36 grams of bile acids during the day, depending how much fat you eat and how many meals you have. The liver usually makes about 600 mg salts/day, so they are recycled in a process called enterohepatic circulation. This has to happen very effectively, because the pool of salts isn’t bigger than 3 g, so they take many turns in a day. They are mainly reabsorbed in the terminal ileum (where the small intestine meets the colon) but also, to a lesser extent, in the colon. Gallstones usually appear when there is an imbalance between the amount of cholesterol, phospholipids and bile acids. If there is to little acids/salts in comparison with the amount of cholesterol and phospholipids the cholesterol might not stay in the fat droplets they are supposed to some of it is left behind and can react with each other to form crystals, that then can grow into stones. A gallstone attack is when these stones are trying to pass through the biliary duct and either get stuck or irritates the cells in the duct. The risk of crystal and stone formation is higher if you have low biliary flow, a high contents of mucus in your gall bladder or if the bile isn’t acidified enough while being stored in the gall bladder (which allows for calcium to precipitate into the bile). Fat is the main trigger of bile release into the duodenum, so it’s not impossible to think that a diet low in fats might actually make you more prone to build gallstones and thus suffer from gallstone attacks. You also need cholesterol to be able to build the bile salts and secrete cholesterol into the bile, so too low cholesterol content in your diet might actually be a problem when it comes to hepatic and gall bladder health. If you already suffer from gallstone issues, and have to be careful with fats because of the pain that ensues when the bile is being emptied, you can still raise the fat content of your food and lower the risk of building more stones. But you have to go slow.